This FATMAX® Right-Handed Box Top Safety Knife has a spring-loaded blade that retracts automatically when pressure on the squeeze trigger is released. 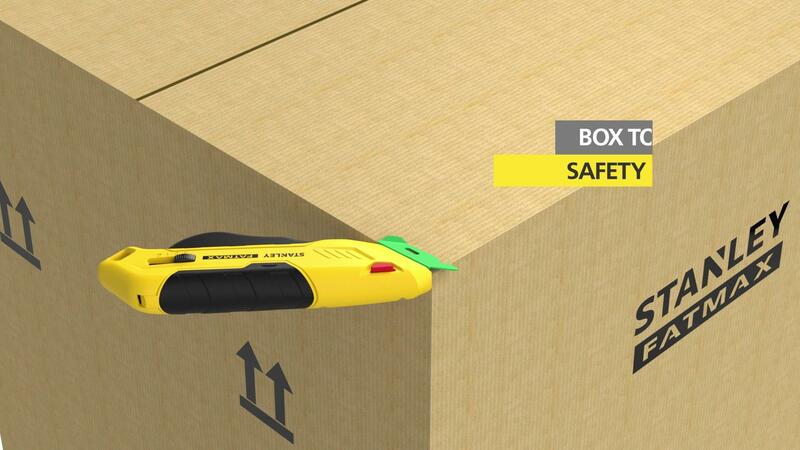 Its box top guide with integrated tape splitter aligns the blade for easy box top removal. Plus, easy trigger squeeze technology exposes the blade and helps reduce user strain. **** With three blade depth settings to limit blade exposure and a blade lock to help prevent accidental blade exposure, this is a great cutting solution for corrugate, tape, and more. When working continuously with cutting tools in a fast-paced environment, accidents can happen. You can help reduce the risk of cuts, lacerations, and punctures on the job with the STANLEY® line of safety knives. Box top guide with integrated tape splitter aligns the blade for easy box top removal. **Compared to metal knives. ****Compared to a thumb slide.